INSTANTLY CLEANS GREASE • GRIME • STAINS! Power Plus’ concentrated degreasing formula penetrates and “Lifts Off” the most stubborn types of soil and grease from most washable surfaces. Power Line, U.S.A. began manufacturing the original product in 1972. Originally manufactured for the Steam Cleaner Industries for use in pressure washers, Power Plus performs exceptionally well in all types of pressure washing and floor scrubbing equipment. Power Line, U.S.A. exclusively supplied the military for Desert Storm and handled national and international distribution of Power Plus. Power Line, U.S.A. has controlled “retail” distribution and our products have only been sold through specialty companies and distributors. You won’t see our products in Wal-Mart, Sam’s, Costco, etc. This gives the end user better service, knowledgeable sales people, and gives our distributors a much better margin. Power Line U.S.A. blends a proprietary mix of citrus oils (D-Limonene based) and a proven non-toxic Butyl Cellosolve with a blend of ultra high performance surfactants and pH builders. The mix is chelated and pH balanced. Chelation is a process to control “fall-out” or precipitation. Power Line U.S.A. is one of the very few companies that bottle our product in clear bottles. This also controls scale build-up in pressure washer coils and gives our product a 5 year shelf life. Power Plus is a true water-based emulsifier. It cleans by penetrating the surface and dissolving the “soils’ rather than “burning” the surface like so many other cleaners. Super Clean, Greased Lightning, Zep, Krud Kutter, Oil Eater all use a high percentage of Sodium Hydroxide or in another words, “Lye.” Sodium Hydorxide mixes are very inexpensive to make – that is why they sell for $8.00 to $12.00 per gallon retail. Cheap cleaners do not dilute out and maintain their cleaning ability. They also “fall-out” when in storage or when heated in a coil. 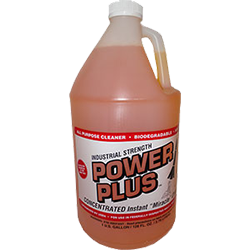 Power Plus’ formula maintains 100% of its pH and cleaning pwer up to 4-1 dilution (4 parts water and 1 part chemical). The chelation process also allowsPower Plus to maintain its effectiveness – even if diluted with hard water. Shake well. Test in an inconspicuous area. Remove surface dust with a soft cloth. Apply polish in a back-and-forth motion at right angles to scratches. 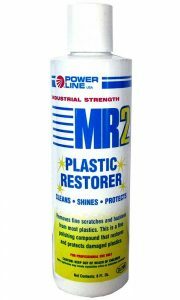 When worst scratches have been removed, reapply MR2 in a circular motion to entire surface using short strokes and light pressure. Allow to dry to a light haze. Buff with a clean dry cloth to slippery glaze using firm short strokes. This procedure is imperative to achieve the best results. Repeat if necessary. The type of cloth will make a difference. Use a non-abrasive, absorbent and lint free cloth. To eliminate any change of scratching, use only disposable cloths. Avoid polyester or rayon wipes! If damaged area is large or badly damaged, a power buffer may be used. Use a clean wool or cotton bonnet and operate buffer at a low speed (approx. 1000rpm). Buffer application may create airborne crystalline silica and inhalation carcinogen. Avoid getting in eyes. In case of eye contact flush with water for 15 minutes. If swallowed, DO NOT induce vomiting. Contact a physician immediately.